There is no way a municipality would condone the discharge of a weapon within its border unless it is done so by a conservation officer or the police. 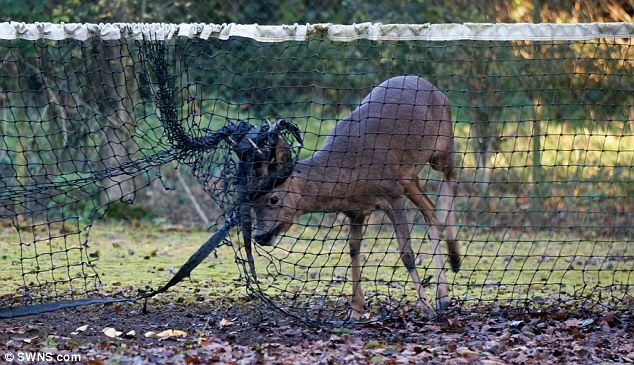 Why not just kill all our urban deer, and subtract it from the hunter total? Call me a jerk but there are aspects to the study and "addressing" of the urban deer issue (everywhere, not just in Victoria) that stray well into the absurd. I found that whole thing re: remote cameras to track the deer to be very silly. Remote cameras in frickin' Oak Bay. Any day on television you can watch dozens of different programs about researchers going into the deep wilderness somewhere to study this animal population or that. Seriously, Oak Bay might just be the most comfortable and convenient and compact locale in the entire world in which to study an animal population firsthand. And so they needed remote cameras to get the data that they required. I know, I'm being unfair. The cameras would still be useful even if you can count the deer as you're walking from the ATM over to Starbucks or strolling down to the beach. But I hope you get my point, that the analysis (analysis paralysis?) has been inflated almost to a farcical degree. I feel like there's a low-budget comedy movie waiting to be made about this. The does will either be captured and the drug injected by hand or the deer will be shot with a contraceptive dart that will administer the drug and mark the spot for identification. If successful, UWSS hopes the program will serve as an effective, community-supported template for urban deer management around North America. Right, so they don't even have a good count of the deer in Oak Bay yet after all this time and all this analysis and all this money spent, but they nevertheless plan to inject the does by hand, and they also nevertheless plan to develop a model that will be feasible in municipalities around North America. There's a deer-infested municipality called Saanich right next door to Oak Bay. It's 10 times the physical size of Oak Bay, and much more suburban and even downright wild in some places. Surrey is 30 times the size of Oak Bay and blurs into genuine wilderness in many places. Kelowna CMA is almost 300 times the size of Oak Bay. If things have been dragged out so long in Oak Bay then how the hell could any lessons learned possibly be applicable to a large suburban municipality somewhere else? Put it another way so I don't sound like I'm being so hard on the researchers: if it's been such a slog in Oak Bay then I think you have your answer. What you're doing couldn't possibly be successful anywhere else. There were three deaths in 2007, eight in 2010, 14 in 2011 and 23 last year. There have been 11 reported deaths so far in 2013. Most of the deer were hit by cars, and either died instantly or were euthanized by police. But a number of deer died in gruesome ways, the report said. One was impaled on a fence, another fell through a swimming pool cover and drowned. A third crashed through the ice on a frozen fish pond. If you genuinely and sincerely care about the welfare of these animals then I don't see how you can regard Oak Bay's "urban deer" phenomenon as anything but appalling. It's not cute, it's not Disney. At this point it's absolutely disgusting. To advocate for the continuation of this ridiculous situation is to despise these deer. But aastra, I saw a big buck in my yard the other day. It was so natural and majestic the way he was eating flowers (that he would never encounter in the wild), pooping in my driveway, and chasing my neighbour's dog with lethal intent. You should have seen him stride obliviously into the middle of the street, forcing a cyclist to dodge onto the sidewalk and the driver of a minivan to slam on her brakes. Majesty! Compassion! Nature! Edited by aastra, 27 November 2018 - 12:15 PM. Lyme disease, a mysterious tick-borne illness, is the fastest spreading vector-borne disease in the United States, and over the past decade, the tick that carries Lyme has been spreading across Canada with alarming speed. TICKED OFF: THE MYSTERY OF LYME DISEASE is a fascinating and eye-opening documentary that explores a disease that has devastating effects, is often misdiagnosed and mistreated, and continues to be mired in a medical controversy. And despite hard evidence that the Lyme-carrying, deer tick has already established populations across Canada, some people claim that patients here are still being told that they cannot contract Lyme in this country. In Oak Bay, police said a woman suffered minor injuries after being trampled by deer at her home near Foul Bay Road and Crescent Road on Monday. The woman discovered the deer in her backyard and opened a gate to let them out, police said. I don't think I've ever encountered a dumber animal than a deer. But deer are just rats with good publicity. interesting that police made a spot assessment of the deer's motives without even bringin it down to the station for questioning. oh ya oak bay does not have detectives i guess they'd have to run it up to saanich for the interview. different mo at least it did not use a machete on the woman. Edited by Victoria Watcher, 05 September 2018 - 10:21 AM. See, those are much smaller, I'd expect them to be dumber - save the dog - but deer. How the hell do they get so big being so dumb? Rabbits, deer, rats, squirrels - they're all things that I have to constantly fight against in my garden - damnable creatures! If they ate the weeds I wouldn't be so annoyed! Oak Bay is not only the violent crime and murder capital of the CRD, it’s also the epicentre of deer assaults. But aastra, I saw a big buck in my yard the other day. It was so natural and majestic the way he was eating flowers (that he would never encounter in the wild), pooping in my driveway, and chasing my neighbour's dog with lethal intent. You should have seen him stride obliviously into the middle of the street, forcing a cyclist to dodge onto the sidewalk and the driver of a minivan to slam on her brakes. Police say that a woman riding her bike was charged and knocked to the ground by an aggressive buck last week. Unbeknownst to her, a buck that was with a doe and fawn was waiting around the corner and charged the woman, knocking her off her bike. The woman suffered a shoulder injury and a mild concussion, according to police. In September, one woman suffered injuries when she was trampled by four deer who somehow made it into her backyard. Edited by Bingo, 27 November 2018 - 11:18 AM. And the story says that four deer "somehow made it into her backyard"
It befuddles me as to how deer would know how to do that. Deer know that once in Oak Bay they have a home for life. The solution might be to have fenced in bike lanes in Oak Bay. Oak Bay Police Chief Andy Brinton is recovering in hospital after being charged by a deer while cycling on Salt Spring Island Sunday morning. Brinton underwent surgery at Victoria Hospital Monday to repair several broken ribs and a broken collarbone according to a release from the force. Oak Bay Deputy Police Chief Ray Bernoties told CBC News that Brinton, an avid cyclist, was by himself when the deer charged out of the forest and knocked him off his bike. "I'm not an animal expert by any means but I'm told it is rutting season,"said Bernoties. "It did seem unusual in that the deer did seem to actually charge him without warning." esquimalt looking at birth control. Yeah it's the fences that are the problem. Do these folks realize that fences serve to keep more than wildlife out of people's yards? Edited by Nparker, 08 March 2019 - 09:54 AM. city wide deer birth control. meanwhile deer hunting is big in bc. i guess that's the urban/rural divide. we give them birth control and in the country they just shoot thousands of them dead each year. bc sells over 100,000 hunting licenses each year just to residents. Edited by Victoria Watcher, 09 March 2019 - 06:56 AM.